All students know that impromptu parties can happen anytime, anywhere. It’s not necessary to have a birthday to celebrate or an exam result to toast – if there are enough people in a room and a few bottles then before you know it you can be in the middle of a house party with more people coming through the door every few minutes! It’s one of the great things about being a student, especially during freshers’ week. Unfortunately there’s always the problem of clearing up afterwards and if it happens to be your student house that the mess was made in then that can prove to be a considerable problem! Here are a few tips that should help to keep your deposit safe when the time comes to move out! 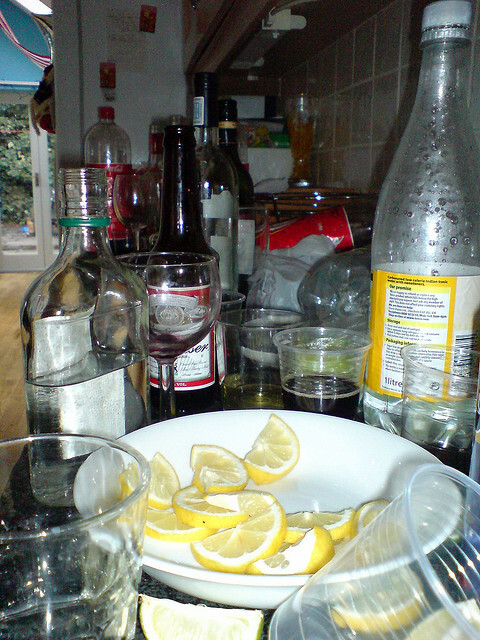 If you’re having a party then one of the things that can take up the most time is clearing up afterwards. Plan ahead by putting recycling and rubbish bins in each room. Cheap, plastic bins don’t cost much but they’ll make the job of sorting the rubbish extremely easy and ensure your house gets back to normal in double quick time. Stains on carpets are bound to happen if you’re hosting a house party and so be prepared to act fast if you see a spillage. Dabbing, not rubbing, stains with a clean cloth will help to transfer the mark away from the carpet but it is always a good idea to have a dedicated stain remover on hand to finish the job and ensure you’re not left with large splodges of red wine all over the house. Don’t waste money going through hundreds of paper towels. Simply invest in a pack of 20 microfiber towels and then pop them in the wash when necessary. It’s also worth remembering that in many cases it is not actually necessary to turn to a cleaning solution – instead just try cleaning down with a microfiber cloth soaked in warm water. Cleaning is a job that few people actually enjoy so it is important to remember not to get too bogged down and stuck on tasks that shouldn’t really take that long. Professional cleaners will say it is better to keep on moving and keep up the momentum than spend hours making the kitchen sparkle while forgetting all about the lounge, bathroom, bedrooms, hall, toilet… Save time by following a cleaning plan of attack! If your carpets and upholstery are in a bit of a state following a year living in a student house then consider bringing in the professionals to take care of business. Remember that with five people living in most houses, the actual cost will not be prohibitive. What’s more, a professional carpet cleaning firm like Chemdry will have just the right tools to hand and also be able to complete the job in a fraction of the time that it would take an enthusiastic amateur.